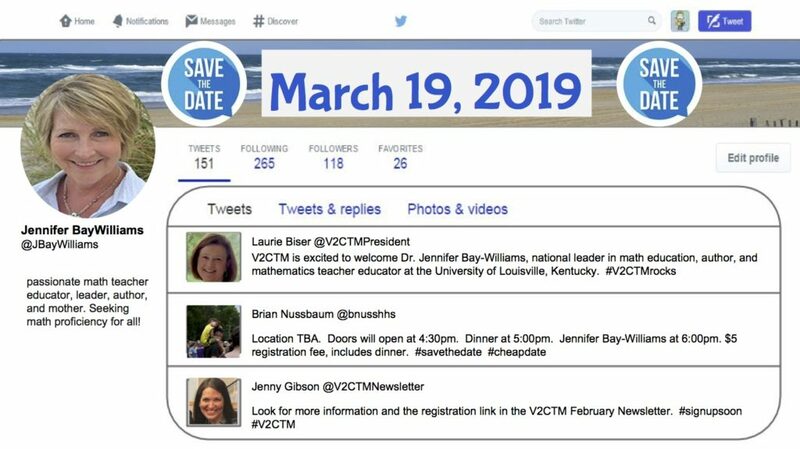 V^2CTM is excited to host Dr. Jennifer Bay-Williams for the Spring Conference on March 19th at Skyline Middle School in Harrisonburg, VA.
More details can be found in our newsletter. Registration here by March 12th, cost is only $5 and you will get a delicious dinner. Save the date for the upcoming V^2CTM Spring Conference which will be held on March 19th with our speaker being Dr. Jennifer Bay-Williams! Please consider nominating a colleague (or yourself) for this V2CTM award. Nominees should have taught for at least five years and should demonstrate outstanding work in the field of mathematics education. For further information and to make a nomination, please visit V2CTM_JoeHillAward. 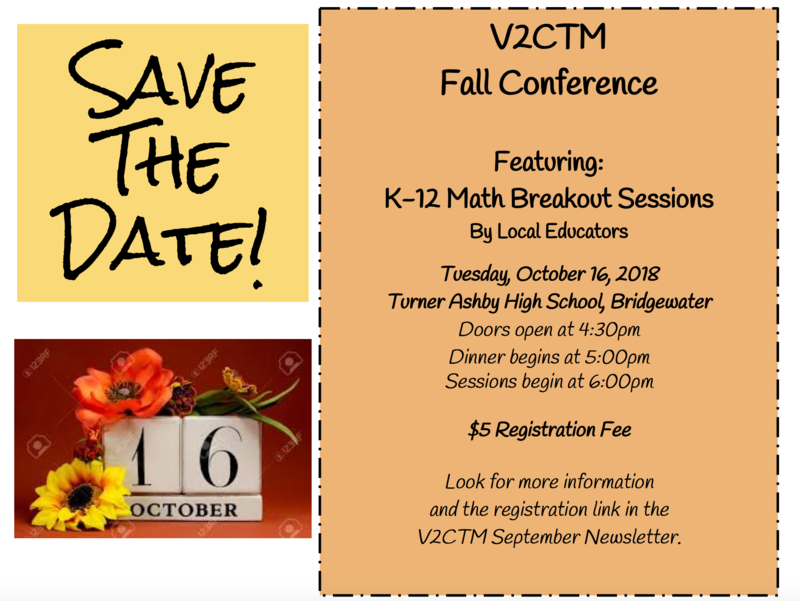 The Spring V2CTM Conference will be held on Wednesday, April 25, 2018, at Skyline Middle School in Harrisonburg. 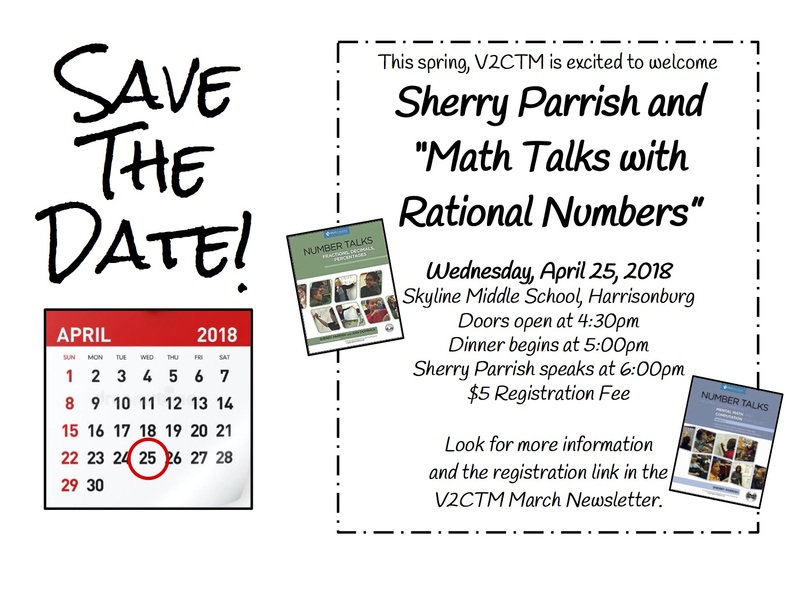 The meeting will feature a keynote presentation by Dr. Sherry Parrish, author of Number Talks: Fractions, Decimals, and Percentages. Please register online at https://tinyurl.com/V2CTM2018Spring by April 11. The Regional 24 Challenge – April 19th! 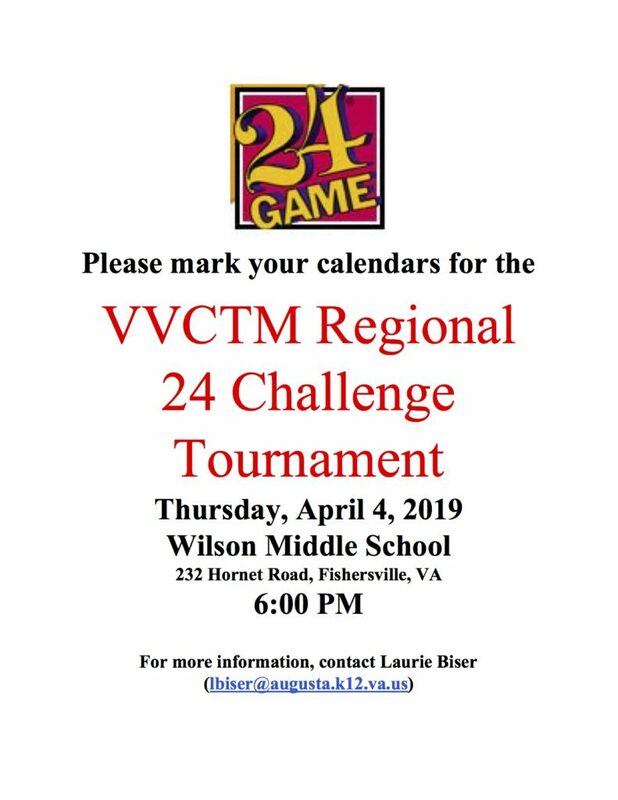 Join us for the Regional 24 Challenge Tournament, sponsored by VVCTM! All elementary schools are invited to participate. Each school may register a team of four players and up to two alternates. 1-2 proctors will be needed per team. In an effort to maximize participation, alternates will be invited to play if seating is available, so they should attend with the understanding that they will play as long as space allows. In the event of limited seating, we will fairly allow an equal number of alternates per school to play until seats are no longer available. Interested in having more than one team represent your school? If space allows, a second-team registration will be offered following the April 4 registration deadline. Please register your school team by Wednesday, April 4 by clicking here. Posted in Uncategorized	| Comments Off on The Regional 24 Challenge – April 19th! 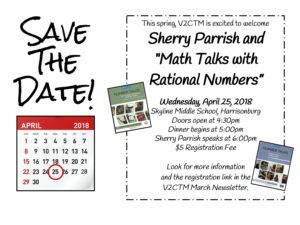 V^2CTM will be hosting Sherry Parrish, author of the Number Talks books, for their Spring Meeting at Skyline Middle School on April 25th.